Celebrity Endorsement and Influencer marketing. Where lies the difference? 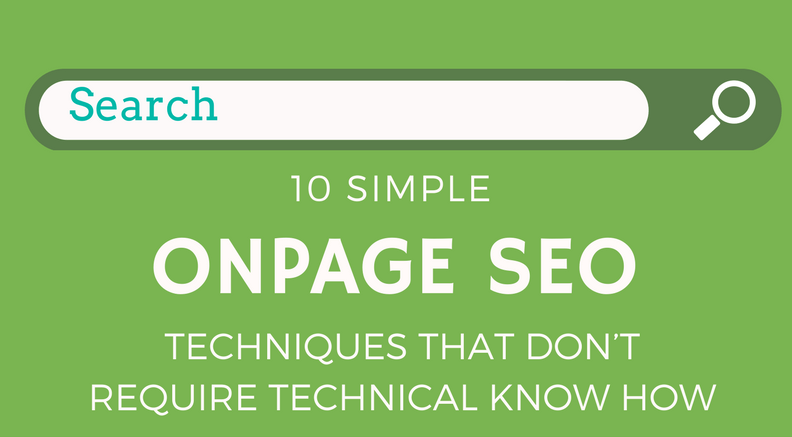 Here are 10 onpage SEO techniques that do not require technical expertise. You can implement these by yourself for your website. Title tags & meta descriptions are part of html code in the header of a web page. They play an important role in helping search engines understand what the content on a page relates to. Make sure to add your primary keywords. Should be unique for every page. Alt tags help search engines read images. Make sure that the images on your site have proper titles and alt attributes. Give the correct description of the image. If your image is not visible in the browser, the text will be shown in its place. Keep them simple & descriptive. Use keywords. There are six header tags – h1 to h6. Their importance is based on their hierarchy. H1 is the most important & h6 is the least. Use h1 tag for the page title. Have only single h1 per web page. Multiple h2 and h3 tags allowed for sub sections but do not overuse them. Keywords are must in header tags. Making sure that all the urls on your webpage are SEO friendly is very important. If they include your primary keyword, even better. They should give the idea of what’s on a webpage. Do not use any special characters in urls. Use hyphen instead of underscore as a word separator. Internal linking is one of the most easily executable yet incredibly powerful onpage SEO tools. Apart from that it also helps the user navigate your website better. Internal links are the links on your domain that go to another page on the same domain that helps to pass link juice & improves ranking. Create a lot of valuable content. More the content, more internal linking. Let the linking be deeper, not just on the homepage. don’t force – the links should be in tune with the flow of your site, enhancing the user experience. Keep the number limited, don’t stuff the webpage with internal links. Xml sitemap alerts search engines about the webpages. It can be generated online and submitted to the google webmasters tool to make the url indexing process faster. Xml sitemap must be placed in the root directory of web server. You might require a little help with this one, google for ‘sitemap generators’ and you will get many for free. Once you have the file, you will need to access your webroot via file manager using your hosting providers back-end. Robots.txt is a text file used by all the websites that guides web crawlers on how to crawl and index the webpages. Robots.txt needs to be placed in the top level directory of a web server in order to be useful. One of the most powerful tools for analysing web traffic. Google analytics helps to track site traffic coming from different online mediums. It also allows you to set goals so you can track your progress. Google analytics code must be placed within <head> tag of your homepage. This will help you understand how your site is performing for the keywords you have optimized it for. Google webmaster tools (gwt) gives you the detailed insight of what is going on your website. Gwt helps you to identify website issues. Gwt provides overview of URL crawling status, html improvements, no. of site links, search queries etc. Do not write for search engines. Yes, it is important to follow certain guidelines while writing for keyword optimization but never let it spoil the user experience. Your content should never look unnatural. Keep in mind the search engine results page. Use the keywords carefully. Your website will be penalized if you stuff the keywords. Spend time on thinking the title, it matters a lot. Follow the formatting for Onpage SEO.